Today we commemorate International Day of Women and Girls in Science! Believe it or not, science is a vital part of the State Library’s day-to-day operations. Whether putting on an exhibition, preparing an item for digitisation or providing hands-on access to you, the public, there are science specialists behind-the-scenes making sure the collection is safe and sound along the way. In the Library’s Preservation and Conservation department we celebrate 16 brilliant women of science. This includes conservators and preservation specialists with a broad range of expertise, ranging from books, paper, photographic materials, preventive and exhibition conservation. We represent an industry of passionate women who love what we do and love to share our experiences. So, how is science part of our day? Cultural collections are comprised of a variety of organic and inorganic materials that can deteriorate over time. Sometimes the materials that make up an object can even cause other materials in the same object to deteriorate. Every item is unique with its own scientific challenges! 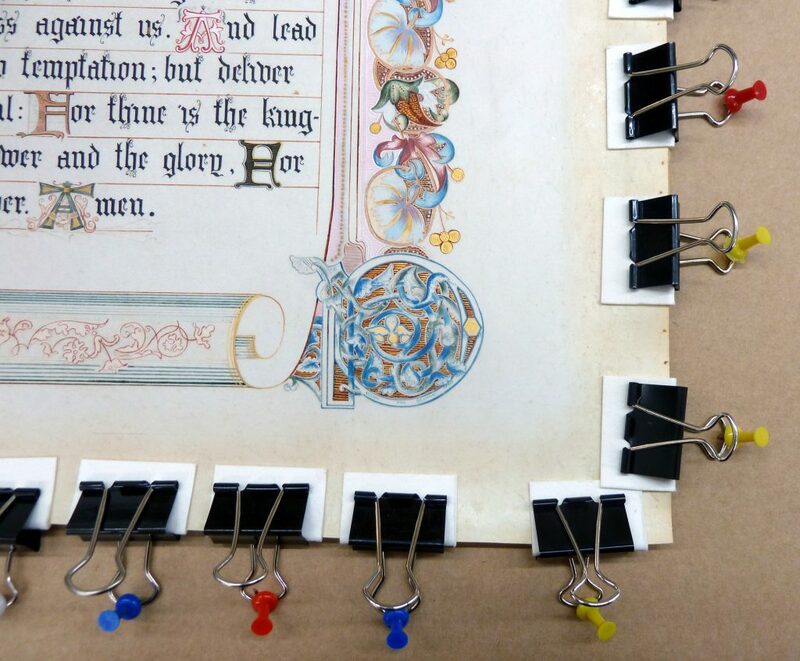 To care for these collections, our conservation and preservation experts need to have a strong understanding of historic and contemporary materials, as well as the techniques used in their fabrication. In a typical working day we may encounter plant and animal fibres, leather and parchment, dyes, pigments and inks, photographic processes, adhesives, varnishes and so much more. Science helps us to understand the deterioration risks specific to each material and how we can prevent or minimise this damage over time. For example, understanding environmental conditions and how they affect certain materials is a major part of our preventive conservation program. Knowing how to correctly monitor, interpret and control temperature, light, air pollution and relative humidity contributes to the successful ongoing preservation of our wonderful collections. Science is also fundamental when designing conservation treatments such as adhesive removal, stain reduction, washing and repairing. To wash a work on paper can be daunting, what with possible soluble media, tears and poor wet strength to consider – do not try this at home! Having studied the chemistry behind water, media and paper interactions allows us to carefully remove soluble acidic compounds from the paper, without further damage. The first wash! The colour of the bath water shows the soluble acidic compounds that have been removed. 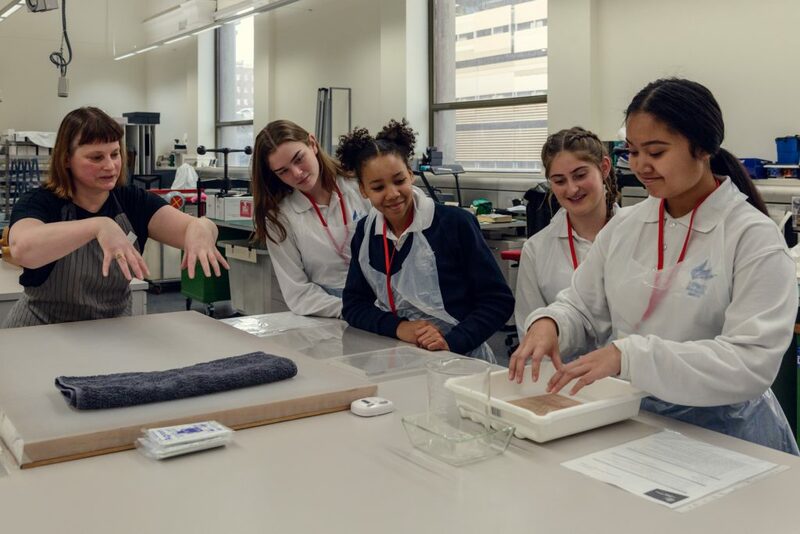 In August 2018 the Library ran a special science-themed program that introduced high school students to the important work that our expert conservators do. This included a series of hands-on workshops in the Conservation laboratory (pictured below), where our paper conservators taught the students all about the science of water and cellulose through the washing of paper. This was a fantastic opportunity to remember why we do what we do, tucked away here in the lab. If we get just one student aspiring to become a conservator, or even just thinking twice about putting sticky-tape on their own documents, then the day was a success. Now the students can recognise the story – and the history – in what may appear to be just a piece of paper. 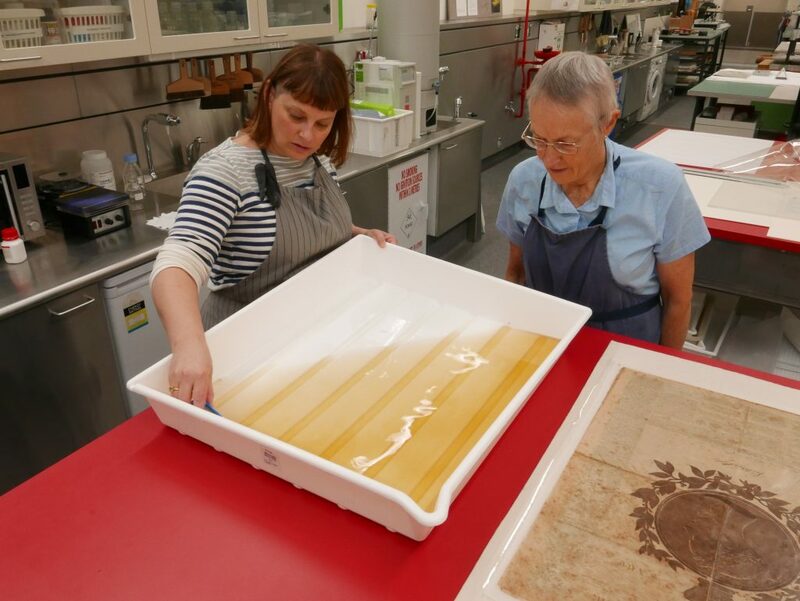 Albertine is a Paper Conservator in the Preservation & Conservation team at State Library Victoria.